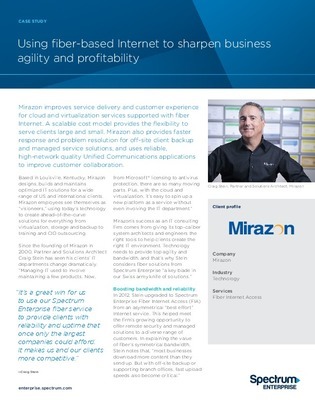 Mirazon is a company that aims to improve service delivery and customer experience for cloud and virtualization services supported with fiber Internet. They wanted to upgrade their Internet service to take advantage of the growing opportunity to offer remote security and managed solutions to a diverse range of customers. Mirazon chose to implement Spectrum Enterprise Fiber Internet Access. Learn about the benefits they’ve experience since switching to Spectrum in this case study.